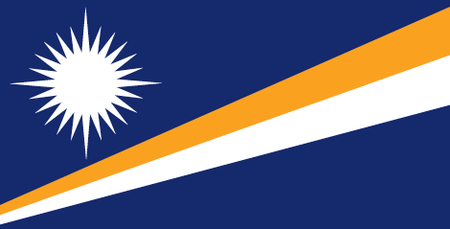 The Republic of the Marshall Islands is a collection of islands and atolls in the middle of the Pacific Ocean just west of the International Date Line. A little less than half of the country's population of roughly 75,000 lives on the main island and capital of Majuro. These islands were settled some 2000 years ago by Polynesian seafarers, and were placed on the European map of the world by the Spanish in the sixteenth century, though they take their name from an eighteenth-century English explorer. Control passed from Spain to Germany to Japan to the US, which granted the islands complete autonomy in 1986, and the Marshall Islands took its seat at the United Nations five years later. Apart from a little farming and fishing, the mainstay of the economy is foreign aid from the US, which used to test its nuclear bombs here and maintains a military presence with the Ronald Regan Ballistic Missile Defense Test Site. Workers and servicemen at that site created the pair of 9-hole golf courses that are today in operation in the Marshall Islands. There is to begin with Holmberg Fairways Golf Course on Kwajalein Atoll, which has two sets of tees that allow it to be played as 18 holes. A second layout on nearby Roi-Namur Island also caters mainly to US military personnel.